I know I've been quiet....that's because I'm on holiday in Malaysia. We've just spent three days in Kuala Lumpur, and have never seen so many gigantic shopping malls in such a small area. Shopping is practically a religion there. There's plenty to see and the food is amazing - oh, and to my relief, they know how to make a decent coffee, so I was able to get my daily espresso fix. The famous Petronas twin towers were well worth a visit. We didn't bother queuing for tickets to go up to the viewing platform, just enjoyed the view from the ground. Then we popped into the Traders Hotel across the park for a drink at their 33rd floor Skybar, and watched the towers change as the sky darkened and the lights came on. We're now in Penang, settled into a restored 19th century shophouse in Georgetown, where we have the top floor to ourselves. We did some exploring of Little India last night and the plan for today was to check out Chinatown and some of the historic buildings along the sea front, maybe visit a temple or two and take some killer photos, before heading out for a celebratory dinner in honour of Bike Boy's birthday. Uh...it didn't quite work out that way. I was struck down by a nasty tummy bug last night, possibly courtesy of the fish salad I ate for lunch yesterday, and spent the day in bed, alternately sleeping and chugging electrolyte solution and bottled water. The birthday boy was left to explore the town on his lonesome. I valiantly struggled out of bed at sunset though, and we went in search of dinner. Our love of night markets led us to the Red Garden, which didn't let us down. I ate a few spring rolls and satay sticks and so far my stomach seems to be coping OK with that. Let's hope tomorrow brings a more fun day for yours truly. I'm often asked for suggestions for healthy packaged snacks - the sort of thing you can keep in your desk drawer or throw in your handbag and just pull out when hunger pangs strike. There are only a few I recommend, because quite honestly, most of them taste like crap and/or are filled with nasty things that I don't want to put in my body. One of my go-to snacks is Slim Secrets bars, which I often have a stock of in the pantry. 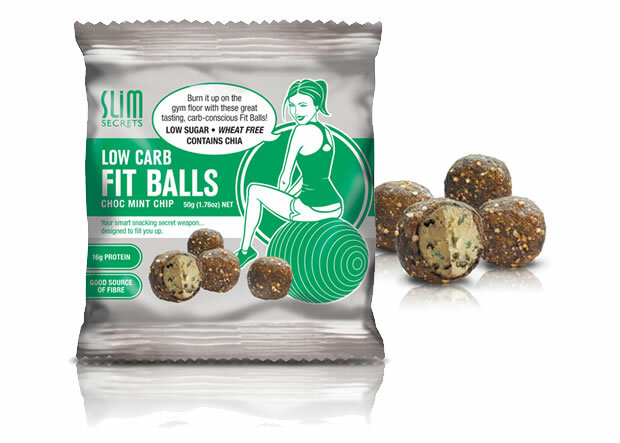 So when I was offered an opportunity to taste-test a new product from Slim Secrets, I jumped at the chance, and the other day a parcel containing packets of Low Carb Fit Balls turned up on the doorstep. I could barely wait to shove one in my gob.... Choc mint chip, yum! They're sweetened with Stevia and contain chia seeds, but the important thing is THEY TASTE GREAT. Probably something to do with the real chocolate... The texture is good too - I hate those tough, chewy protein snacks that you can barely bite through. These are nothing like that; they're soft and easy to eat. And did I mention how good they taste? 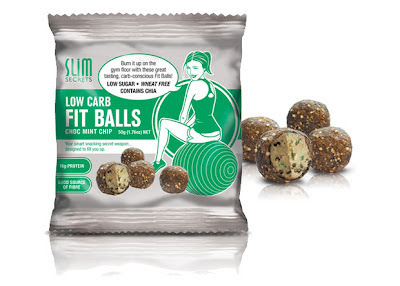 The nitty-gritty: There's five balls to a pack and the lot only comes to 177 calories. They contain 16g of protein, only 1.9g of carbs and 5.8g of fat. I found them quite satisfying - I didn't get hungry again for several hours, thanks to the protein and fat content - nor did I crave more and more, since the sugar content is so low. I'm taking a packet of these babies in my carry-on luggage on our flight today. They're perfect for travelling - no mess, no fuss, they meet my nutritional needs and they taste great. Couldn't ask for more, really. Disclosure: This is not a paid post. 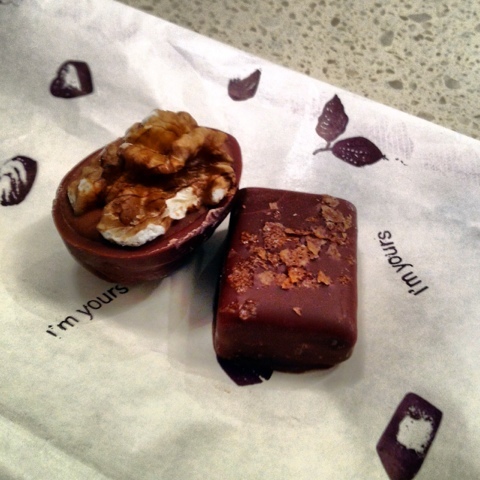 I did receive samples of the product to review, however no monetary remuneration was involved. Opinons expressed in this post are my own. The Baby had a school excursion today. I dropped him at the station this morning so that he and his classmates could spend the day in the city as part of their Business Studies curriculum. Apparently they had to visit specified retail businesses and answer questions about them, plus take photos of said businesses - presumably to prove that they were actually there. I was very happy with my present...until I discovered that they had also visited Chanel and Tiffany's. ...Want a tasty and healthy meal that's ideal for breakfast, lunch or a snack? 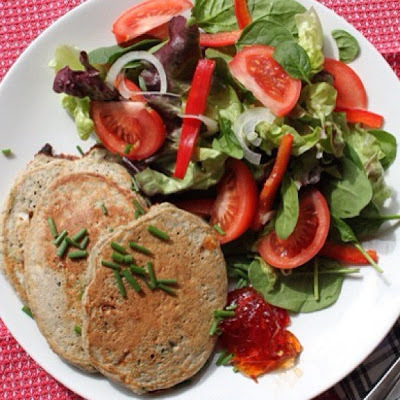 I made these cheesy broccoli pancakes the other day and they are sensational! I've just had the last lot for breakfast - you simply pop them in the toaster and in a couple of minutes your meal's ready. Pop over to Healthy Helpings and get the recipe. Better still, click on the Healthy Helpings thingie over there on my sidebar and buy Michelle's recipe book*. You won't be sorry. I'm having a lot of fun cooking at the moment - I hadn't realised how much of a rut I'd slipped into with my food. Sometimes all it takes is a few new recipes to spark things up and reignite your love affair with healthy food. Somebody smack me over the head next time I forget that, OK? *Disclosure: I have an affiliate arrangement with Healthy Helpings - if you buy a recipe book via my sidebar widget, I will receive a small commission. I wouldn't promote it if it wasn't fantastic though, so go buy one, OK?